Jamie Claw Clip ~ Surround your face with a look you can be proud to own. 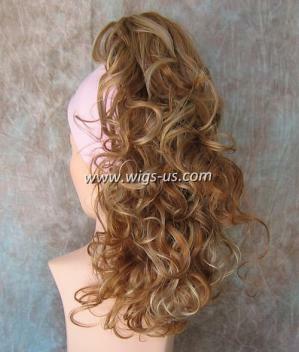 The Jamie hairpiece features a beautiful cascade of medium curls that reach down 15 inches in length. The perfect size for your head shape. As part of the Mona Lisa Collection, the Jamie was constructed with high quality and care. The synthetic fibers are both soft, and extremely durable so that they last you well into the future. A natural look that reflects the light beautifully. No one is going to even realize you're wearing anything extra in your hair, and neither will you. The Jamie hairpiece is very lightweight, and won't leave you feeling weighed down throughout the day. Utilizing a claw clip attachment, the Jame is probably one of the easiest hairpieces to attach that we have. Little kids could attach them it's that easy. Available in a variety of signature colors, we have the one you've been searching for. At a price this low, you would be smart to order your Jamie hairpiece immediately before it goes back up.